Needless to say, I missed the no-music memo that any seasoned runner is probably well aware of when it comes to teaming up with a Running Buddy. As I made a mental note to silence Spotify next time I reach out to [insert name here] for a workout (if she'll still have me! ), it got me thinking -- what other unspoken laws of running sisterhood should I abide by? Like all successful relationships, having a running buddy requires communication and compromise, explains Jessica Woods, a running coach for both Mile High Run Club and Nike+ Run Club in New York City. "You may have to adjust your workout if you prefer running with a friend," she says. "Honestly, I always offer to meet the other person," says Woods, and it's doable whether you're in the suburbs with car access, or in a busy metropolis. "It's easy in New York City with the amount of subways and Citi Bike options we have," she adds. "I'm also a member of New York Sports Club, so it's quite easy to find a drop off and shower location near any meet-up route." I'm way too out of breath to hold a decent convo. Woods says, "If you're running faster than conversation pace, there's something comforting in running side by side in silence." Beyoncé just dropped a new album and it's basically the fire beneath your soles. Your best bet is to address the earbud situation before the run to avoid doing something your friend really hates, Woods explains. Let your friend know that you love running with background tunes, and ask if she'd be annoyed if you have one earbud in on your opposite side, with the music turned down low. "If this person is going to be your go-to running partner, you should talk about all the likes and dislikes and pet peeves ahead of time--maybe on a nice easy recovery day--and set all of those expectations up front," suggests Woods. Not into chit-chatting? Offended if your zippy pal speeds ahead? Speak up, she says. "We all have our quirky tendencies, and I'm a classic over-sharer, so I'm not shy about addressing them head on," Woods adds. You're tired, sluggish, busy, hungover, or sans clean workout clothes--too bad. You don't want to be known for having cardio commitment issues. Plus, Woods says, you never end up regretting a run once it's over. "Of course you really want to cancel your running date, but that's the point in having one, to hold you accountable," she says. "I try to only cancel if sick, injured, or a work conflict gets in the way. But I can't say 'tired' constitutes a cancellation." When you run with someone enough times, you may find yourself in a slightly embarrassing situation where you need to make an urgent bathroom pit stop. You're panicked, thinking, Where is the closest bathroom? Oh my god, we have to find one now. Will you stand guard if I go to the bathroom here? But fear not: Woods promises, "It happens to the best of us." "Whether it's embarrassing bowel movements or any other bizarre experience, I act like whatever the situation is is normal and carry on because you're going to be with this running partner for the remaining duration of the run," she says. "So keep it moving!" While it's often fun and motivating to sync up your workout schedules, it may not always make sense training-wise, especially if you're following a strict training regimen for an upcoming event or recovering from an injury. "Sometimes it can be more of a hassle than what it's worth to coordinate," Woods says. "If you're a beginner runner, you may not be as concerned about pace, number of intervals, distance. However, if you're a more experienced marathoner or seriously training for any race distance, it's more important to hit those workout goals without compromising." So don't feel bad saying no. For some people, a constant "you've got this," "keep going," or "you're almost there" can come off as condescending, not to mention annoying. If you or your running S.O. isn't into the ra-ra kind of chatter, try other ways to stay positive mile to mile. "My best friend--and when I'm lucky enough, running partner--knows that cheerleading or motivational speeches aren't going to work on me, so she'll purposely talk and talk without requiring much of a response from me in an attempt to take my mind off of the running task at hand," Woods says. Another one of Woods' tricks is to try and compare the run to something more difficult or more ridiculous that you've been through together "to try and downplay the difficult task at hand," Woods explains. "Remember that time we ran nine miles in nine degrees? If we can get through that, we can get through these last two miles." Don't feel embarrassed to speak up if you really need to slow down and pause for a minute, but be diligent about revving things up again. "If I absolutely must stop or take a walking break, I set a definitive time or distance of said walking break and announce it to my running parter: 'Hey, I need to walk for a minute, but just to that next stoplight and we can pick it back up again,'" suggests Woods. "No need to be embarrassed, just own it and set expectations." It sort of defeats the purpose of running together, Woods explains. "If you're going out for an easy six-mile recovery run, I think it's odd for one person to constantly speed ahead then wait," she says. "On a recovery run day, you're not going to lose much fitness by slowing your pace down 30 seconds per mile, so slow it down and enjoy your friend's company." That being said, there are times when Woods would give the go-ahead to working at different paces. An example, she says, is a tempo run. "If the workout is a one- to two-mile warm up, four miles at tempo pace, then a one- to two-mile cool down, I think it would be acceptable for one person to run faster during the tempo portion if the other is really struggling," she says. "You'll at least have your person for the warm up, cool down, and however much of the tempo run you can hold on to." Running is a competitive feat by nature, and there are ways to have fun with it without being disrespectful. 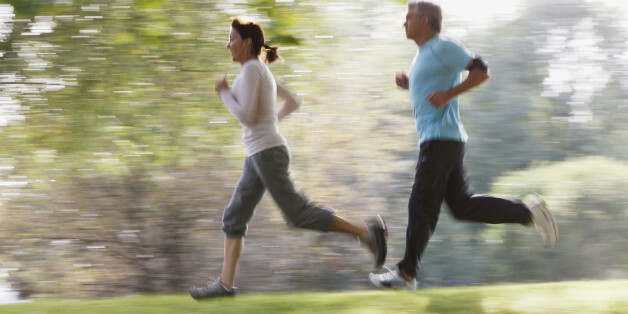 Challenge your friend to tacking on another mile with you without stopping. Or, mix up a walk-jog with some interval sprints, and the winner picks up coffee. "I embrace [the competitiveness]," Woods says. "Want to go for a run together? Bring it on." Of course, it's convenient to work out beside someone of a similar fitness and endurance level. "But I appreciate running with someone fitter or faster than me, pushing me further than I would have run solo," Woods says. "So, I don't mind doing the same and paying it forward by running with someone who needs me." Health.com motivates you to eat smart, stay fit, be happy, and live your best life.